The 10 Best Spots for Wings in Michigan! The chicken wing, ladies and gentlemen: A delivery vector for sauces of all sorts, compact, tasty, and enjoyed by most. Offered up from sports bars to pizza places and beyond, there are plenty of places to find them. For those asking where to start, the answer is the same as it ever was: Right here. Grab your napkin, and bib, because it's about to get saucy at these 10 great Michigan chicken wing joints! Kalamazoo's Old Goat Tavern represents easily the most unique way we’ve ever seen to have Buffalo wings brought to you: In the center of a cheeseburger. Using Buffalo mayo backed up by a Buffalo boneless wing, Old Goat Tavern constructs the Moo, Oink and Quack, a cheeseburger of bizarre dimensions that may well leave you questioning if it was some kind of barbeque-induced dream. Those who'd prefer their wings more standard, meanwhile, will be able to find their taste of choice waiting. It's no surprise that a bar in Detroit will offer some of the best wings in Michigan, and that's just what we'll get with Sweetwater Tavern. The preparation process is easily what makes these wings distinctive in the state, as they're marinated for 24 hours daily before being dredged in spices and fried. Given that it sells an average of 600 pounds of wings per day, you know that this is the place to consider for wings in Detroit. Once again, Traverse City steps in to provide an item on our list, as the Blue Tractor Cook Shop—featured once on a Food Network episode of “Burgers, Brew & 'Que”—delivers chicken wings in an impressive style. 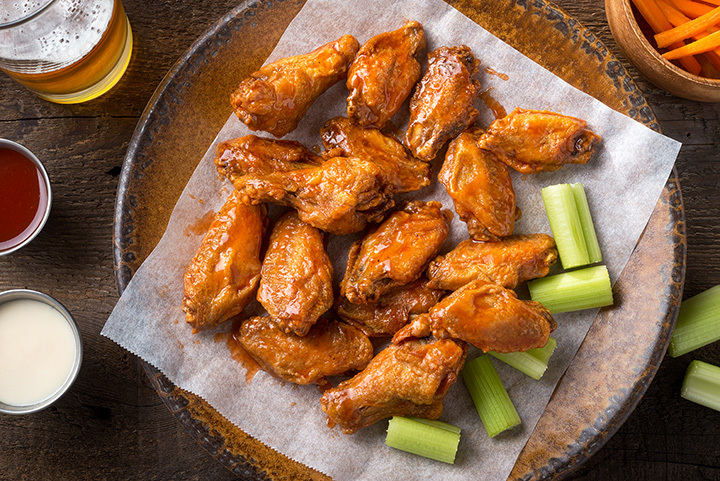 Served in one or two pound lots, the wings are cider-brined, house-smoked, and delivered in your choice of Buffalo or standard barbeque sauce. Naturally, that's not all that's on hand here—burgers, pizza and more are on hand—but for Buffalo wings, it's a great start. Welcome to Dexter, where they know wings. At least, that's what the folks at Wings N Things would have you believe. Offering wings in six, 12, 24 and 50-wing packages, as well as boneless wings, diners can enjoy the plain, very hot, plain hot, and teriyaki-garlic parmesan, which is probably somewhere in the middle. Throw in pizzas, sandwiches, salads and plenty more, and Wings N Things will have wings, or other things, enough to satisfy most anyone. Tiny little Constantine brings in an item for the list as the Constantine Brewing Company—not far from the southernmost part of US 131 in Michigan—offers up an array of barbeque options. Buffalo wings will certainly be in attendance, but so too will dishes ranging from brisket to sausage and beyond. Additionally, small-batch beer and wine will also be on hand to try, offering some flavors unique to just this little town. Grand Rapids has no shortage of places to eat, but for those hungry for wings, Wing Doozy is likely high on the list. Wing Doozy offers its wings in packages ranging from the eight to 50-piece packages in both standard and boneless. There are two separate flavors of Buffalo sauce to enjoy, one a sweet and spicy version known as the Buffalo Doozy, and a second version with some Cajun-inspired elements known as the Mardi Gras. There's even a set of three rubs to enjoy with your wings, and plenty of other exciting options from chicken strips to corn nuggets. Also found in Grand Rapids, Mike's Wings delivers wings in traditional, whole, and boneless styles for the wing-hungry patron, in packages ranging from six to 50. Strips, gizzards and livers also come into play for those who prefer less conventional chicken options, and with over 20 different sauces from Buffalo to mango habanero, there will be just about something here for most everyone to enjoy. A Michigan-focused chain restaurant with locations throughout the state, Brann's is known for a variety of things, including its sizzling steak and array of televisions available in its dining rooms to ensure no one misses a sporting event. Also on hand is an array of wing choices, including what it calls the “Dirty Ranch,” a combination of Buffalo and ranch sauces to make a thoroughly distinctive option in Buffalo wings. The oldest pizzeria in Marquette, Buffalo wings are indeed on the menu, and recommended specifically on TripAdvisor. That's a good sign, and for those who'd rather not have the spicy chicken, the good news is there will be other options on hand. An unexpected option emerges in wing choices, and it starts in Saginaw at Sporty's Wing Shack. Featuring four different flavors of Buffalo wing—starting at the naked wing merely cooked in the Buffalo style to the mild, medium and hot sauced wings—as well as a massive slate of other options. Those who want a challenge and a potentially ruined evening, meanwhile, are invited to try the 650,000 Scoville-unit “Suicide Wing” that requires patrons to sign a release before eating.